• Full network access. Most users have full physical and logical network connectivity, which increases risk because end-point devices may be infected by malicious software. • Backhauling inefficiencies. ...Intel IT supports the hosting of applications and content on external clouds. Today, users must authenticate to Intel’s back-end before they access externally hosted resources. This requirement can cause latency, inefficiency, and overuse of bandwidth as well as raise potential privacy concerns. • Inconsistent developer and user experience. Applications are hosted inside and outside the corporation, but consistent interfaces are not provided to developers to use appropriate security capabilities. Similarly, the user experience involved in meeting security requirements differs based on how the application is hosted and on the user’s device. • Support for a hybrid cloud model enabling applications and services to move smoothly in and out of the cloud. • A consistent experience for users and developers with the same access methods and security interfaces no matter where the application or data is hosted and regardless of the end-point device. 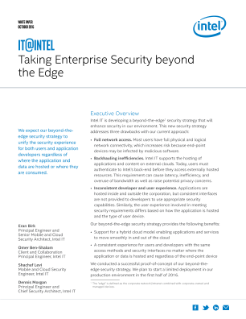 We conducted a successful proof-of-concept of our beyond-the-edge security strategy. We plan to start a limited deployment in our production environment in the first half of 2016.